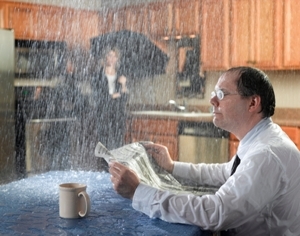 Most homeowners never think about their roof, until it starts to leak. Roofs leaks can be caused by a number of reasons. The first sign of a roof leak is typically a water spot on the ceiling and other times there is enough water pouring in that a bucket is needed to catch the water. Regardless of why you have a leaky roof and how much water is coming in, it's important to address the roof leak quickly. Some homeowners temporarily patch or cover a hole or tear in their roof with a big blue tarp and others aren't sure where the roof is leaking from. No matter the reason, the best thing is to hire a professional roofing contractor. Schwartz Residential Roofing has been fixing leaky roofs for a long time. Our experience and knowledge help us find the source of the leak quickly and accurately to stop further damage from occurring. There could be a number of reasons why your roof is leaking and various leaks will require varying repairs. Has there been a recent storm that has damaged your roof? Have high winds blown shingles off your roof? Has your aging roof already outlived its warranty? Do you have missing or damaged shingles you can see from the ground? Don't neglect a leaky roof. Time will multiply the damage on the roof and damage could begin to accumulate inside your home as well. Moisture can wreak havoc on your attic and within your walls. Mold can grow and interior moisture damage could be expensive to repair. Sometime more expensive than the repairing the roof leak. There are many variables that go into determining the cause of the roof leak. The age of the roof, the design of the house, the brick or siding above the roof line, all could be factors into why there is a leak. Each situation requires its own repair solution. That is why it is important to hire an experienced, knowledgeable roofing professional. Most anyone can smear roofing cement or caulk to make a temporary repair. It's important to get to the root cause of the leak and make a permanent roof repair. 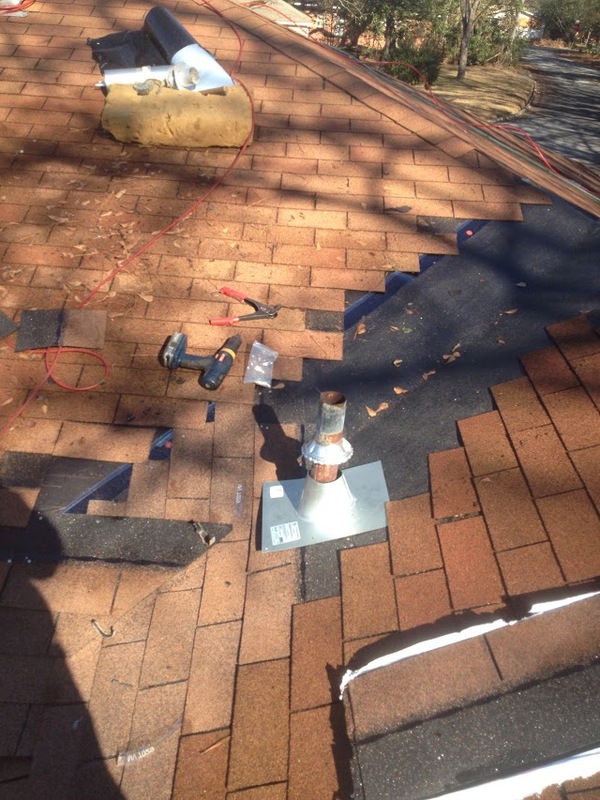 Schwartz Residential has been fixing and replacing leaky roofs for a very long time. We will give you a free estimate to repair your roof leak. We back our repairs with a 1 year warranty. Contact us for help to determine the cause of your leak and a suitable solution to fix it quickly. We've saved countless clients money by fixing their leaks promptly and have also saved clients thousands by determining they just need a repair when they thought they'd need a whole new roof. We are happy to come out and assess the leak, provide a quote, and schedule the work. With a positive track record and many positive testimonials throughout Macon, Warner Robins, Forsyth, and all of Middle Georgia we are the best choice for your roof repair. Schwartz has skilled, trained, certified, insured, and focused roof installers with the experience to know how to repair any type of roof. We can repair metal roofs, shingle roofs, and flat roofs. Schwartz Residential Roofing can also install chimney caps, seal brick chimneys, replace rotten siding, or repair wall flashings. Sometime just because the water is coming in from the ceiling, doesn't mean it is a roof leak. It could be the brick, siding, or windows. That is why it is important to hire a residential roofing company with experience and knowledge to determine what is the source of the leak and make the correct repair. Don't delay! If your roof leaks, call Schwartz Residential Roofing. Fixing a leak now could extend the life of your roof and save you thousands of dollars in potential damage to your home and belongings. Macon, GA, Warner Robins, GA, Forsyth, GA, Milledgeville, GA, Bonaire, GA, Kathleen GA, Byron, GA, Perry, GA, Roberta, GA, Ft. Valley, GA, Cochran, GA, Jeffersonville, GA and all other surrounding areas. Augusta, GA, Evans, GA, Grovetown, GA, Martinez, GA, North Augusta, GA, Aiken, SC and all other surrounding areas.